You may notice a new member of the Lee County Sheriff’s Patrol function on Boca Grande. So if you get the opportunity, please welcome Sgt. Cecil Fitch. Sgt. Fitch is a welcome addition to the patrol team in Boca Grande, and we are very pleased to have him assigned to our unit. Sgt. 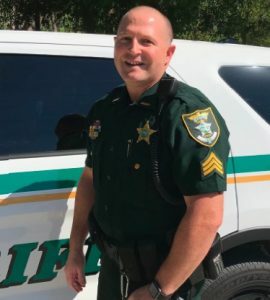 Fitch has a background in the Lee County Sheriff’s Road Patrol; the Gang Unit; Fugitive Warrants team, where he actively sought and arrested people with outstanding warrants, as well as a Road Patrol Supervisor. Sgt. Fitch officially reported to Boca Grande and served his first day on July 3. Welcome Sgt. Fitch! I would also like to report that Boca Grande experienced some criminal activity in and around the downtown area in the early morning hours of July 3. A preliminary investigation was initiated, and all leads are actively being followed up on. The modus operandi of the crimes was to enter unlocked vehicles and commit theft of property inside the vehicle. While Boca Grande is a very safe place for people and property alike, there is always a potential that a wrongdoer will commit a criminal act. As a crime prevention practice, the Lee County Sheriff’s Office encourages everyone to properly lock their vehicles at all times. If anyone has information related to these crimes, please contact the Lee County Sheriff’s Office at (239) 477-1000.